We all have limited time available to pursue these important aspects of life. We’re stretched thin trying to do it all. In order to truly be successful we have to 1) Make priorities and 2) Figure out how to manage them. I first came across the 4 Burners Theory through James Clear and it changed the way I approach managing my time and life priorities. I want to take the same idea and look at the way we manage money. For him, the answer was easy. He even acknowledged that his clients are not paying for him to get a superior return or to drastically beat the market average. They want the peace of mind of knowing that they’ll be able to take care of themselves in retirement. Paying an extra 1% a year for peace of mind isn’t cheap. Over a lifetime of investing, you’ll likely end up paying over $500,000 for someone else to think and plan for you. If paying almost half a million dollars for someone to plan for you sounds fine, then please, close out this tab and move along. If the idea of paying that much for a financial advisor sounds crazy, well… that’s because it is. My whole goal here at PF Geeks is to help people take control of their finances. I want to help you take back control of your money. The most difficult part in managing your own money is figuring out the best way to allocate the money that you are working so hard to save. 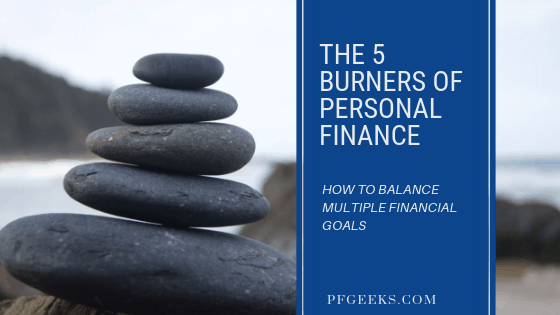 Today I want to outline the 5 burners of personal finance to help you take control of your money to chase after all your financial goals. How do you handle saving for all those different financial goals that you might have? How do you know whether you should invest for retirement or pay down debt? Should you prioritize saving for retirement or your kids’ college? Is it better to travel in your 20’s when you are young or wait until you are 60 and retired? When is the best time to start giving to causes that you care about? Now, there definitely isn’t room in this one post to answer each of those, but I hope to provide a small framework to help you start making some of those decisions for yourself. Want to make a budget that will help you reach your goals? We recommend using a zero sum budget! One way to approach multiple financial goals is a balanced approach where you spread out your monthly surplus between your various priorities. The great thing about this approach is that you are able to make progress in every area and nothing ends up getting neglected. You have the comfort of not being caught off guard. As you start to reach certain goals, you would then re-allocate. So while you may not be aggressively paying off your debt, eventually you would have it paid off and you could then put that money towards your other goals. But it may not be the best approach. While you might be making some progress in every area, each area will be moving along slowly. This slow progress might end up leading to no progress. It also may not be the best choice mathematically. If you have high-interest debt, then you may be better off with a different approach. And at some point vacations and travel might have to take a back seat to setting yourself up for the future. A second approach is to goal stack. If you’re familiar with debt payoff strategies, this is most similar to the debt avalanche or snowball approach. The idea here is to focus on certain goals, while neglecting or putting the bare minimum towards others. Ideally, this is done in a way that “stacks” and builds a snowball of success. This approach is probably best if your primary goal is paying off a large amount of debt, especially if it is higher interest. If you’re stuck with credit card, student loans, or an auto loan that is crushing your monthly budget and limiting your monthly surplus, this is a way to quickly free up cash. And the sooner you can pay off your debt, the sooner you can move on towards other goals like saving for retirement or for a home downpayment. The flexibility here is that you can allocate your monthly cash flow in a way that reflects your priorities and that can build off of each other. As you knock out certain goals, you can move towards one of the other two approaches where you save in a more balanced way. The huge advantage of goal stacking is the momentum you start to build. When you are able to make great progress on specific goals each month, it will motivate you to work even harder. The primary disadvantage though is that you might have to neglect certain goals for the sake of others. For instance, you might have to delay saving for retirement while you pay off your debt, but the hope is that once you are debt free, you’ll be able to quickly catch up and get where you need to be. This isn’t perfect though and there might just be a better way. The third approach is less about picking a single way forward and more about breaking your life into seasons. Instead of trying to be perfectly balanced or all out chasing certain goals, you may want to let your strategy be flexible depending on where where you’re at in life. When your young, you may need to prioritize paying off debt and saving for a house. As you begin to have kids, you may need to start focusing on saving for their college education. Once you have your bases covered, you can start focusing on saving for retirement and travel. This might seem like a reasonable approach, and I think its how most people end up unconsciously allocating their savings, but it has a major pitfall. These people spend their whole lives saving, but never for retirement. They are free of consumer debt, living in a nice house, and the kids are going to make it through college without student loans. All is great until they wake up at 45 or 50 with no retirement savings. The worst part about this is that they don’t have the investing timeline to allow for compounding returns to work their magic. They’ve spent their whole life saving, yet they have nothing saved. The truth is there is no one perfect system to reaching your financial goals. You can follow one or another but the best option is creating a personal approach that is guided by some absolutes. The goal here is to find what 1) works for you 2) makes financial sense and 3) is guided by some “money absolutes” or self-imposed rules. Once our emergency fund is full, all high interest debt is paid off, and we have automated our giving, then we can focus on our long-term goals while setting money aside for travel and vacation. We don’t vacation without an emergency fund. We don’t vacation if we have high interest debt. We don’t vacation unless we are giving 10%. We don’t vacation unless we are meeting our employer match. Our approach involves a mix of the three. We “goal stack” by prioritizing an emergency fund and eliminating all high interest debt early on. After we finished those two, we were able to turn our focus to saving for retirement and for the house we just bought. All along the way we have some guiding principles that we call “money absolutes.” No matter where we are at with our income, these are the rules we have for ourselves. We are always giving to our church and always contributing to receive our employer matches. What interest rate is your “tipping point” for paying debt off debt instead of investing? What are your short-term financial goals? How much do you want to give each month/year? What are some money absolutes or rules you want to set for yourself? What season of life are you in right now and what are your priorities? Regardless of which approach you take, the key is to consistently be living on less than you need. The more money you can be funneling into paying off your debt or putting towards your financial goals, the more successful you’ll be. 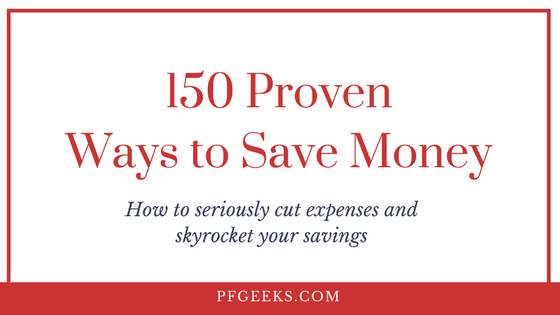 If you’re struggling to find ways to save money, download my list of 150 Ways to Save Money below. It’s a massive list with detailed strategies to cut your expenses and increase your income. How have your financial goals changed over time? What are some of the small habits that have helped you make progress on your long-term goals?